The problem of the verbalistic (and the journalistic) is expressed in an aphorism in the Incerto: mathematicians think in (well precisely defined and mapped) objects, philosophers in concepts, jurists in constructs, logicians in operators (…), and fools in words. Two people can be using the same word, meaning different things, yet continue the conversation, which is fine for coffee, but not when making decisions, particularly policy decisions affecting others. But it is easy to trip them, as Socrates did, simply by asking them what they mean by what they said –hence philosophy was born as rigor in discourse and disentanglement of mixed up notions, in precise opposition to the sophist’s promotion of rhetoric. Since Socrates we have had a long tradition of mathematical science and contract law driven by precision in mapping terms. But we also have had many pronouncements by idiots using labels. People rarely mean the same thing when they say “religion”, nor do they realize that they don’t mean the same thing. For early Jews and Muslims, religion was law. Din means law in Hebrew and religion in Arabic. For early Jews, religion was also tribal; for early Muslims, it was universal[i]. For the Romans, religion was social events, rituals, and festivals –the word religio was a counter to superstitio, and while present in the Roman zeitgeist had no equivalent concept in the Greek-Byzantine East[ii]. Law was procedurally and mechanically its own thing, and early Christianity, thanks to Saint Augustine, stayed relatively away from the law, and, later, remembering its foundations, had an uneasy relation with it. For instance, even during the Inquisition, a lay court handled the sentencing. Theodosius’ code was “Christianized” with a short introduction, a blessing of sorts — the rest remained identical to the pagan Roman legal reasoning as expounded in Constantinople and (mostly) Berytus. For Jews today, religion became ethnocultural, without the law — and for many, a nation. Same for Syriacs, Chaldeans, Armenians, Copts, and Maronites. 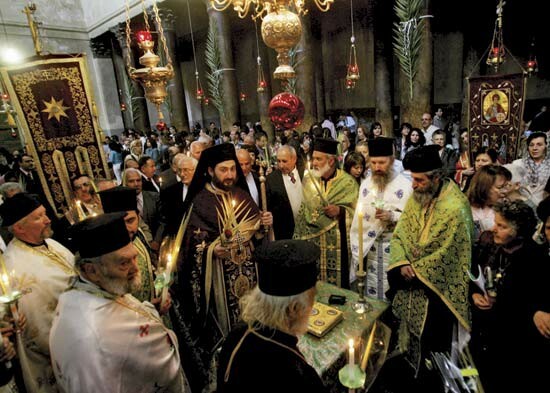 For Orthodox and Catholic Christians religion is aesthetics, pomp and rituals, plus or minus some beliefs, often decorative. For most Protestants, religion is belief with neither aesthetics, pomp nor law. Further East, for Buddhists, Shintoists and Hindus, religion is practical and spiritual philosophy, with a code of ethics (and for some, cosmogony). So when Hindu talk about the Hindu “religion” they don’t mean the same thing to a Pakistani as it would to a Hindu, and certainly something different for a Persian. When the nation-state idea came about, things got much, much more complicated. When an Arab now says “Jew” he largely means something about a creed; to Arabs, a converted Jew is no longer a Jew. But for a Jew, a Jew is someone whose mother is a Jew. (This has not always been the case: Jews were quite proselytic during the early Roman empire). But Judaism, thanks to modernism, somewhat merged into nation-state, and now can also mean a nation. In Serbia-Croatia and Lebanon, religion means something at times of peace, and something quite different at times of war. When someone discusses the interests of the “Christian minority” in the Levant, it doesn’t mean (as Arabs tend to think) promoting a Christian theocracy (as I said earlier, the church has always been uneasy in its relationship with the profane; full theocracies were very few in Christian history, just Byzantium, a short attempt by Calvin and few other episodes). He just means “secular” or wants a marked separation of church and state. Same for the gnostics (Druids, Druze, Mandeans, Alawis). The problem with the European Union is that the naive I.Y.I. (intellectuals yet idiots) bureaucrats and representatives of the talking “elites” (these fools who can’t find a coconut on Coconut island) are fooled by the label. They treat Salafism as just a religion –with its houses of “worship” — when in fact it is just an intolerant political system, which promotes (or allows) violence and refuses the institutions of the West –those that allow them to operate. Unlike Shiite Islam and Ottoman Sunnis, Salafis refuse to accept the very notion of minorities: infidels pollute their landscape. As we saw with the minority rule, the intolerant will run over the tolerant; cancer requires being stopped before it becomes metastatic. IYIs, being naive and label driven, would have a different attitude towards Salafis if theirs was labelled as a political movement, similar to Nazism, with their dress code an expression of such beliefs. Banning burkinis may become palatable for them if it were made similar to banning swastikas: these people you are defending, young IYI, will deprive you of all the rights you are giving them, should they ascend to power and would force your spouse to wear a burkini. We will see in the next chapter that “belief” can be epistemic, or simply procedural (pisteic) –leading to confusions about what sort of beliefs, are religious beliefs and which ones are not, disentangled through signaling. For, on top of the “religion” problem, there is a problem with belief. Some beliefs are largely decorative, some are functional (they help in survival); others are literal. And to revert to our metastatic Salafi problem: when one of these fundamentalists talks to a Christian, he is convinced that the Christian is literal, while the Christian is convinced that the Salafi has the same oft-metaphorical concepts to be taken seriously but not literally –and, often, not very seriously. Religions, such as Christianity, Judaism, and Shiite Islam, evolved (or let their members evolve in developing a sophisticated society) precisely by moving away from the literal –for, in addition to the functional aspect of the metaphorical, the literal doesn’t leave any room for adaptation . So not only Salafism is not a religion, but it is not even a workable political system; just something someone came up with to imprison people in the seventh century Arabian Peninsula. Note 1: Islam, ironically, has not always been purely law. The Ottoman Empire managed to do a separation between Islam as law and the state as Qanun, with a body of laws imported from the Byzantines (adaptation of Justinian’s and Theodosus’ codes). So did the Umayads relying on Christian diwan (the subjects in the educated class were Greek-speaking Syrians), importing notions from Roman law, particularly those concerned with commercial matters. Note 2: The Ottomans, for a long time, acted as if they were a continuation of the Byzantine empire; their main bone with the Russian Czar was that, after the fall of Byzantium, the title “Czar” (i.e. Caesar) belonged to the Sultan.